You spend years forming friendships, people come and go, so by the time you hit your 30’s the bunch of misfits you’ve naturally selected over the years are friends for life…they’re not going anywhere. Then you go and move half way around the blinkin’ world and find yourself without…no-one to go for a drink with after work, invite for dinner, go for brunch, girls night, play rounders with in the park(!). So you start from scratch, take a deep breath, and put yourself out there hoping that some of those you meet aren’t complete nobbers! Two years on (literally to the day) and we have thankfully met some great people here and made a few friends. So, when one of these new found friends decided to up sticks and move to NYC, explaining that she planned to drive there – oh sure it’s only 3000 miles (actually her chosen route was over 4000 as it turned out)! – and invited me to join her for the first leg of the journey I wasn’t going to say no. It felt like a big deal, her leaving, so to mark it by doing something big (ish) seemed a fitting way to say goodbye, for now. Our road trip began in Monterey at the patio bar of the InterContinental hotel which was all Bloody Mary’s, white wine spritzers and chat about whether the guy playing the acoustic set actually had ‘the voice of an angel’ or whether in fact it was his dazzling smile that we were wow’d by! That night we ate at Hula’s, a brilliant place with the most amazing fish soup I ever had – seriously if you ever find yourself in Monterey go there, and then prepare for the food coma that follows! Day two and we drove, Thelma and Louise style, to Point Lobos for a ‘hike’. I say ‘hike’ because I have come to realise that in California ‘hike’ is used to describe pretty much any type of walk and that ‘hiking trails’ are usually clearly outlined paths (sometimes paved) that just happen to be in an area of natural beauty. I will therefore describe our jaunt that day, slightly less dramatically/American, as a walk. This aside it was completely beautiful. The ocean was the colour of blue Gatorade and the views incredible – apparently “the greatest meeting of land and sea in the world”. Day three we headed inland, towards Sequoia National Park, via Hollister. I’m not sure what we expected from Hollister but apart from a few cool old buildings it seemed a bit dead. We did however come across The Cinderella Motel which looked uhmazing! Complete with Cinderella dolls lined up in the window, a small model carriage out front and themed rooms we thought it would have made a wonderfully tacky overnighter! We finally arrived in Three Rivers, just outside the park, and headed straight in like a couple of tourists in our shorts and t-shirts – neither of us thinking to check the weather. As we drove higher and higher the temperature dropped lower and lower and on seeing the remnants of the last snowfall we started to worry that we perhaps hadn’t quite dressed appropriately. We would not be deterred from our mission however, to see the largest tree in the world. Sure enough on leaving the cosy confines of the car we were greeted by a freezing blast of air and scrambled to put on whatever clothes we had, which caused a ripple of stifled laughter from some other, better equipped visitors! Another ‘hike’ led us towards the afore mentioned tree – The General Sherman. As we approached it really didn’t look that impressive, we were all like ‘I’m sure I’ve seen bigger at Muir Woods‘ and ‘there are definitely bigger ones in New Zealand‘ blah blah. What a pair of complete morons, as if some scientist had got the measurements wrong! Anyway, as we arrived at the base we both fell silent (finally! ), it was an absolute beast, you had to practically lean at a 45 degree angle to see the whole thing. Needless to say we took loads of photos, none of which really capture its true size but hopefully these give you some idea. Day four we head south, through more of the park and on to Bakersfield. Not the most inspiring place on paper but we made the most of it. Home to the worlds largest shoe (apparently) and The Kern County Museum. Kind of a living history jobby with a whole village of historic buildings, from dentists to jails, that depict the life of early Californians. We thought it was pretty cool…not sure what that says about us! Our home for the night was the recently renovated Padre Hotel, the newest but oldest hotel in Bakersfield, which first opened in 1928. If you find yourself passing through, I’d definitely recommend a stay. Day five and it was further inland towards Las Vegas. We power through, amusing ourselves by looking for weird and wonderful things to see along the way. Then we see a sign for Peggy Sue’s Roadside Diner, quickly google it and decide ‘we HAVE to stop’. If, like me, you feel you grew up in the wrong era you will love this place. It’s a totally legit 50’s diner. So with great joy I perched at the counter telling myself that, though not totally out of the question, it was pretty unlikely that at any moment the entire place would break out in to a Grease style song and dance medley – can you only imagine! It was all I could do to remain cool, desperate to order “a double Polar burger wit’ everything and a cherry soda wit’ chocolate ice cream” (Grease ref. for those not in the know), I settled for a hamburger and coke! 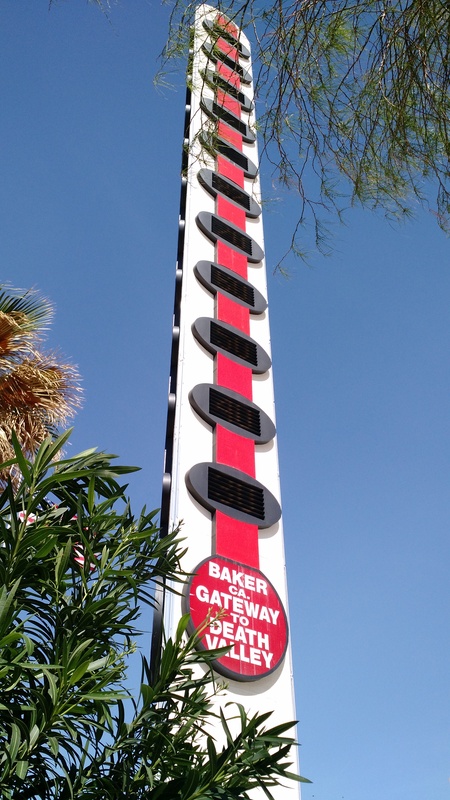 After all this excitement our journey continued towards another roadside gem…The World’s Largest Thermometer, in Baker. After prancing around taking a few pictures and venturing in to the gift shop for a chat with a giant vulture we were pretty giddy which, as it happened, was set to continue because on leaving Baker we happened upon the Alien Fresh Jerky store…only in America! Some time later and we see Vegas on the horizon. A drive down the strip to see The World’s Largest Coke Bottle (of course!) would mark the end to this first leg of her journey and my departure. And so after five glorious days of sights seen, world’s largest’s visited, burgers eaten, margaritas drunk and 650 miles driven, we bid each other farewell (sad face).